I’m happy to announce my first HTML5 Responsive WordPress Starter Theme named NARGA using on ZURB’s Foundation CSS, a powerful tool for building prototypes on any kind of devices. NARGA supports child-theme so it’ll help you do amazing things faster & easier than ever before. It is a magazine theme with minimalistic style. Suitable for any niche, especially for news or magazine sites. Along with the elegant design the theme is easily customizable with numerous theme options through Theme Customization. As you see, its minimal design with simple layout & color. It’s help you create your own child theme with custom style and layout. NARGA is a versatile HTML5 responsive WordPress theme using on ZURB’s Foundation CSS, a powerful tool for building prototypes on any kind of devices. Two columns layout with right sidebar include bottom widgets. Dynamic footer’s widgets to fit the footer width. Widget areas are content-aware, meaning that they only appear if they contain active widgets. Highly configurable widgets that give you full control over their display. Had full-width template with full-width layout without the sidebar. Support WordPress Post Format: Standard, Gallery, ASide, Quote, Status, Video, Image, Chat, Link which means that you can choose per-post layout. Post thumbnails that work with WordPress featured image functionality and provide extra features. Fully internationalized, so you can translate the theme in any language. You should place your translations files to child theme languages folder. Theme settings page using build-in WordPress Customization. Custom header image (logo) & layout’s background color, image. Ability to create custom templates for any post type in multiple ways. 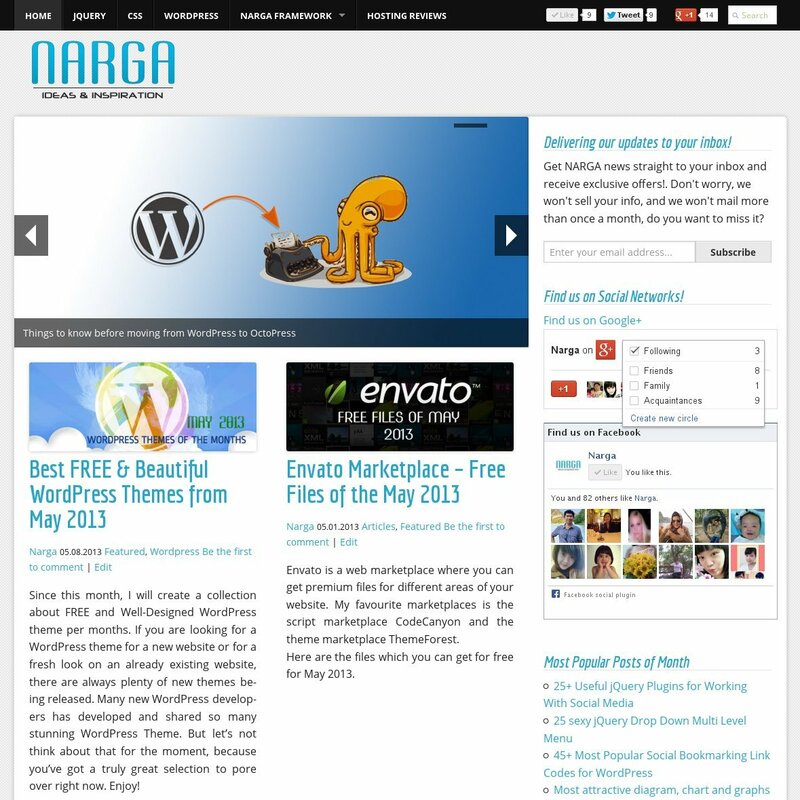 Create a theme folder in your /wp-content/themes directory called narga-child. After that create a style.css file in /wp-content/themes/narga-child folder. At the top of your style.css file, add the below information. * Description: Describe your child theme. This is officially supported way of modifying themes in WordPress. 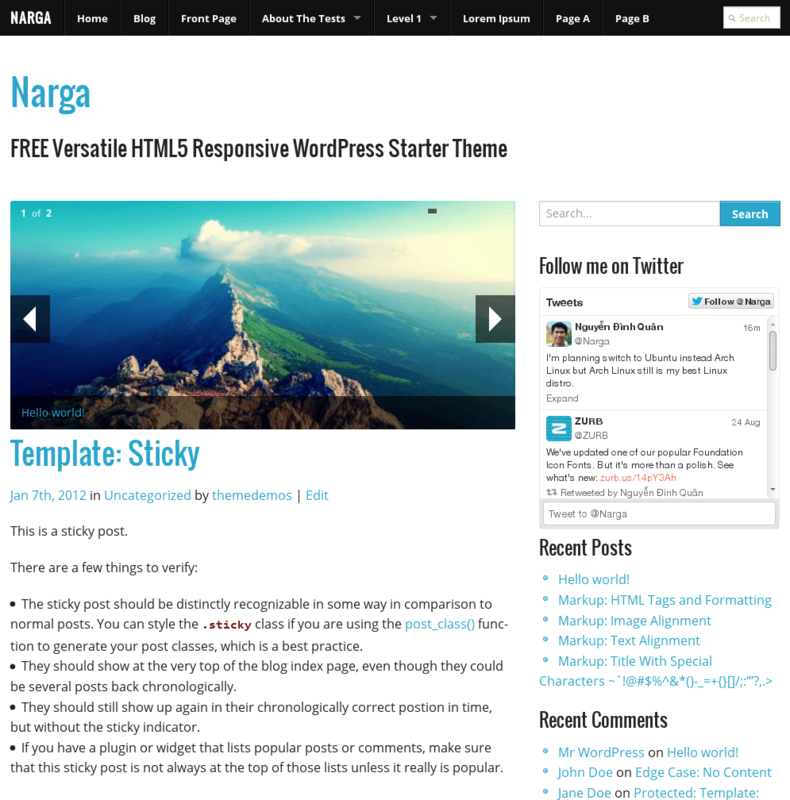 NARGA using build-in WordPress Customization. Here is some advance custom you can change with NARGA. Default Customize features: Site Title & tagline, Header image (change the website logo), Custom Background and Static Front Page. Website Navigation: Allow you can choose Main Menu and Secondary Menu (Footer menu, it’s disappear on small screen like mobile device). Options to make your top bar stick on top or contain to grid layout. It’s allow you display post’s breadcrumb too. Like ZURB’s Foundation, you can show or hide custom Top Bar title. Featured Post Slider: You can choose the category to display Featured Post in slider, you can choose the number of slides (default is 5), it’s supports you hide or show slider indicators too. Make sure the image that set as featured image has at least 640×290 pixel to display correct on slider. If you move to NARGA from another theme, you can use AJAX Thumbnail Rebuild to rebuild all thumbnails. Narga.net v8 – Improved version of Neir, child theme from NARGA with minimal design and simple color. 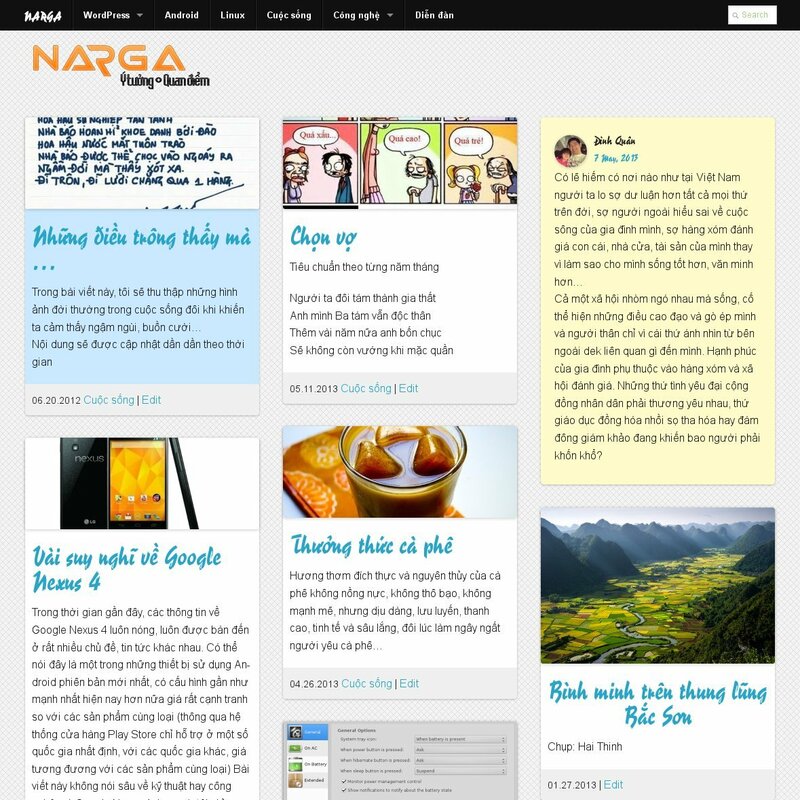 Narga.org v6.5.1, child theme from NARGA with grid posts layout, minimal design and simple color. Hope you enjoy with NARGA. Now, I’m crafting a simple child theme as a gift for you in next week. My second site now runs on narga framework,have a look at it buddy and send me a feedback.When can we except a child theme that runs on your frame work? Thank You Nguyễn for your reply. I am eagerly waiting for the tutorials. BTW can you tell the expected waiting time.